We do product reviews for the intentional family! Twenty-eight science projects and experiments to be done outside will spark kids’ creativity and help them develop science skills through hands-on learning. Projects focus on Earth and the environment, plants and animals, rocks and minerals, and space, bringing science learning home and into the backyard. Young scientists can make a cave system and find out about underground rivers, construct a working model of tectonic plates and learn about earthquakes, build a telescope and look to the planets and stars, and more. With stunning photography, succinct step-by-step instructions, and detailed explanations, Maker Lab: Outdoors takes readers on a journey of discovery. 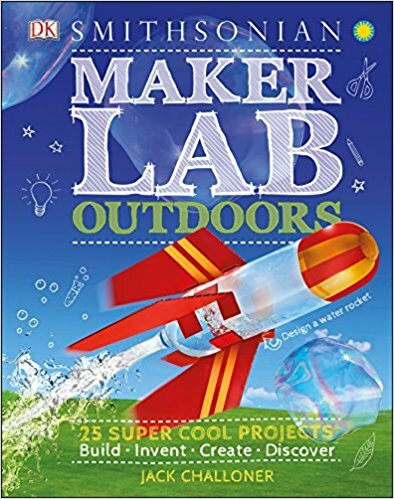 A must-have for every young scientist curious about their surroundings, and for makers, crafters, and those who enjoy exploring the outdoors. About DK Publishing: DK Publishing is a division of Penguin Group books that is known as being a New York Times bestselling publisher and distinctive books including ebooks and apps. DK stands for Dorling Kindersley after Christopher Dorling and Peter Kindersley who had a book packing company in London in 1974 and started to publish in 1982. Check out their children’s catalog here. Author Info: Jack Challoner has written more than 30 books on science and technology, and also acts as a science consultant on books, magazines, and television programs. His most recent book for DK was the award-winning Maker Lab (2016). Follow Momma's Bacon via Email! Follow 'the' BACON! Enter your email address to follow this blog and receive notifications of new posts by email.